New Service: Mile High Drone Services is currently rolling out a program where drone pilots can upload their panoramics and have them viewed on a google map along with other panoramics. Open the "Panoverse" panel to learn more or go to www.MileHighDroneServices.com/Panoverse to see the map with all the panoramas we have. We are happy to announce that our chief pilot was one of the first people in the USA to receive a FAA issued license for operating drones. The FAA started accepting applications at 5:00 AM on 8/29/2016 and he had his application submitted by 5:01 AM and a few hours later an authorized FAA examiner presented him with the actual license. Burritt was able to get his application approved so quickly because he is already a pilot for manned aircraft and he took an online test proving his knowledge around drones, the law, and the national airspace. Mile High Drone Services not only has a 333 exemption (including a closed set production exemption) but is one of the few company's in the US which has a pilot with a FAA issued commercial drone license. We are a company in Broomfield Colorado who specializes in low altitude aerial photography. Typical applications are real estate, roof inspections, crop inspections, fracking ponds and site surveys. We have a "333" waiver from the FAA which makes it legal for us to do this. In addition, each of our drones carries a minimum of $1,000,000.00 liability insurance. We only fly drones with 6 motors (hexcopters). Hexcopters will stay in the air if a motor or prop fails. A quadcopter will immediately crash if a prop or a motor fails. Our pilot has been a licensed pilot for over 25 years. In addition, he is a certified "drone instructor" with the AMA (Academy of Model Aeronautics). We also recently received the "Closed Set" certification from the FAA. This means we can now fly drones for television and movie production. We also recently received certification to fly drones at night and also have multiple Certificate of Authorizations to fly in airspace where drones are typically not authorized to fly in. Not only is climbing on a roof dangerous. In many cases it will void any warranty you have and may actually cause more damage to your roof. 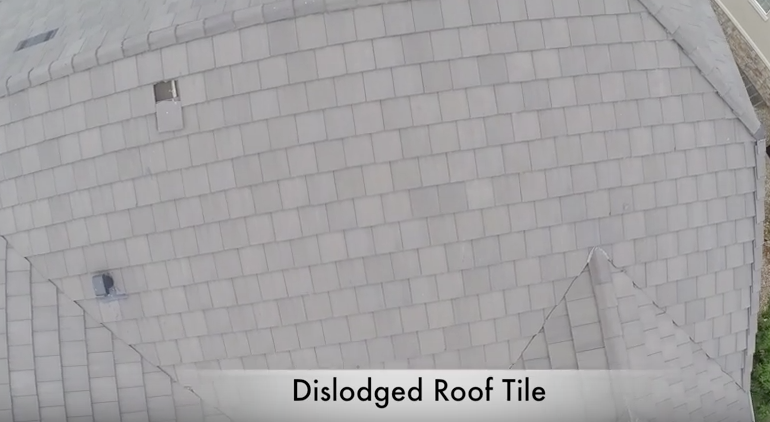 A roof inspection via drone is a safe way to get a close look at your roof. The images that we get are extremely detailed. The home owner is welcome to be present during the roof inspection and view the roof in real time on a remote monitor. After the inspection, the home owner will be given a flash card which not only has the high definition video but also detailed high resolution stills of the roof. Roof inspections are ideal after a hail/wind/snow storm or when in the process of purchasing a home. The photo shown was from a roof inspection done for a home that was for sale. If you are a realtor, you know how important the presentation is. More and more listings are using aerial photography to show off a listing and make it different from the rest. This is especially true on property that is priced at $500,000 or more. Many home owners are expecting this. Our expertise is in flying drones and getting those great shots. We will shoot the property and provide you with a flash drive containing all the video and high resolution images. You can then give this raw footage to your own staff to publish it as you deem fit. We recently started adding 360 degree panoramic shots. Below is an example, use your mouse to scroll around the photo. We not only create the panoramic photo but we also can host it on our server and provide you a simple URL to link to from your web page or to provide to the home owner or potential buyers. Most realtors work with firms who are experts at creating the brochures and web content. It is much more economical for you to work with the people you already know rather than hire us to edit the footage and work with your staff. We will do this if you want, but most realtors just want the raw footage. We have a 100% guarantee. If you are not happy with the video footage and still footage that we provide you will get a complete refund. No questions asked. We get a lot of business from referrals and do not want an unhappy customer. Contact us for a quote, you will probably be surprised at how reasonable our rates are. Regardless of who you use, we can't emphasize enough the importance of dealing with someone who is licensed with the FAA and also carries insurance. If you use someone who does not have the FAA clearances guess who is on the hook for a $10,000 fine? The same goes if there is an incident with the drone and the drone causes property or personal damage. Anything can happen and that is why responsible people carry insurance. Each of our drones carries $1,000,000.00 in liability insurance. Whether it is a daredevil going for a world record or a simple celebration, we can help you get interesting photos for your event. Shots that no one else can. Of course, we will only do a shoot if it can be done safely. The photo shown here was done with the drone flying over vacant land and it was never over any people. It seems the only press that drones get is bad press. We visit local schools to talk to students about drones and in some cases provide live demonstrations. This is an attempt to show students the good things that drones can do. We provide this service for no charge. If you are a school teacher and would like us to come in then send us an email. Currently, we only have time to support schools that are within 25 miles of Broomfield Colorado. We like to help out non profit organizations as much as possible. If you represent a non profit organization and could use our services then please let us know. Depending on what you need we may be able to help you out for little or no cost. Even if you are not in the Broomfield Colorado area feel free to reach out. We travel all over the country with our drones and who knows, we might be traveling in your area. 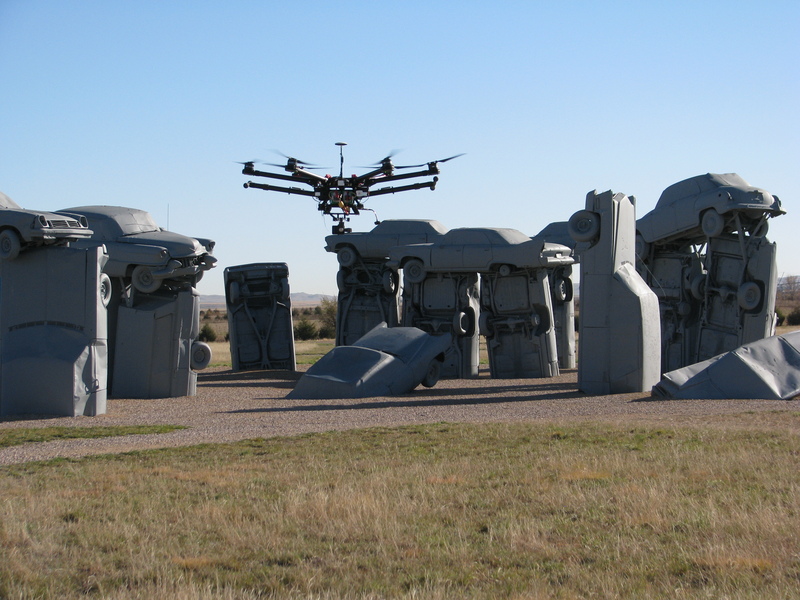 In November of 2015, we got drone footage of Carhenge (Nebraska) and the Enchanted Highway (North Dakota). Heck, if we are on the road and see something quirky we might just stop and drone it for the heck of it and then give the footage to the non profit. We are currently in beta trials which will allow drone pilots to upload their panormas to our servers. Once they are uploaded and processed they will show up on a Google map and you can easily find panoramics that were shot around the world. If you are a drone pilot and would like to participate then go to our Contact Us link and send us an email. Below is a panorama of an abandoned gold mine in Colorado. © 2015 Mile High Drone Services All rights reserved.